It seems like midsize crossover SUVs are selling now more than ever before. The Mazda CX-5, in particular, has been one of the automaker's best-sellers over the last few years. A big reason why is its efficiency. The Mazda CX-5 beats out much of the competition when it comes to fuel economy, and that includes the Jeep Cherokee. Jeep is among the most well-known and respected brands in the world. The Jeep Cherokee is a formidable opponent of the Mazda CX-5, so strap in for this head-to-head battle. We did some research on the Cherokee and we have our results. See our chart below to determine which SUV is better for you. These SUVs are very similarly priced. The Mazda CX-5 starts at an MSRP $24,150 and the Cherokee comes in with a price tag of $24,395. For the most part, the cost shouldn't be a determining factor for you. However, what comes with the price tag is what sets these two apart. The Mazda CX-5 is significantly more efficient than the Cherokee in the city. Even if you commute daily, city efficiency is still important. 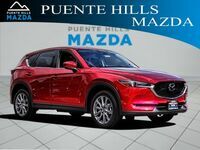 Modern technologies are more abundant on the Mazda CX-5 and the vehicle features more interior cargo room despite being three inches shorter in length. 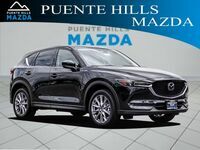 Come down to Puente Hills Mazda and check out the 2018 Mazda CX-5. Whether you're a family man or woman, single, or dating, the Mazda CX-5 is perfect. It features a ton of space for kids to be comfortable, but it is also practical for those without children. Now is your chance to schedule a test drive online! Pick a date and time that works for you and we will be waiting!